Die Jovis, 27 Maii 1830. Meltham Inclosure Bill, Petition against. Petitions in favor of it. East India, &c. Trade, Petitions for opening, from Otley & Stroud, referred to East India Com ee. Watching, &c Parishes Bill, Petition from Holy Trinity, Goodramgate, York, in favor of. British Spirits, Petitions from Berwick & Dumfries against additional Duty on. Inventory Duty, (Scotland,) Petition from Dumfries respecting. 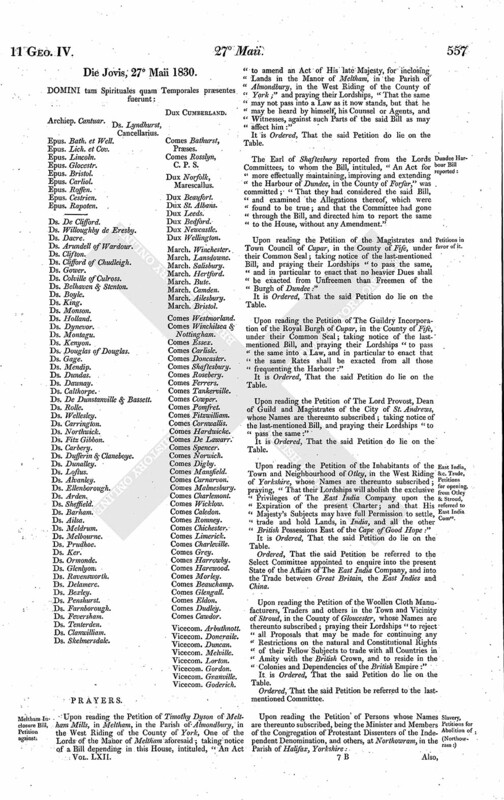 Constabulary Laws, (Ireland,) Petition of Magistrates of the King's County against Alteration of. Four per Cents Dissents Bill. Messages to H.C. with the 3 preceding Bills. Bute Ship Canal Bill, Petition against. East Retford Election Bill, Witnesses to attend, & produce Documents. Birmingham Grammar School Bill, Petitions against, referred to the Com ee. Criminal Laws, Petition from Rugby for Amendment of. Dundalk Roads Bill, Petition from Dembin, &c. against, & for Alteration of Grand Jury Laws, Ireland. J. Taylor to attend the Com ee with Documents. Highgate Grammar School Bill, Standing Order No. 94. dispensed with, & Bill committed. Queensferry Improvement Bill, V. Melville sworn on. Hickson's Marriage Annulling Bill, Witnesses to attend, & produce Documents. James & Spencer v. Price & Gott. Ouchterlony v. Ld. Lynedoch, & Macdonald. Several Witnesses discharged from further Attendance. Report of H.C.on Northern Roads to be printed. Ds. Skelmersdale. Comes Bathurst, Præses. Upon reading the Petition of Timothy Dyson of Meltham Mills, in Meltham, in the Parish of Almondbury, in the West Riding of the County of York, One of the Lords of the Manor of Meltham aforesaid; taking notice of a Bill depending in this House, intituled, "An Act to amend an Act of His late Majesty, for inclosing Lands in the Manor of Meltham, in the Parish of Almondbury, in the West Riding of the County of York;" and praying their Lordships, "That the same may not pass into a Law as it now stands, but that he may be heard by himself, his Counsel or Agents, and Witnesses, against such Parts of the said Bill as may affect him:"
The Earl of Shaftesbury reported from the Lords Committees, to whom the Bill, intituled, "An Act for more effectually maintaining, improving and extending the Harbour of Dundee, in the County of Forfar," was committed; "That they had considered the said Bill, and examined the Allegations thereof, which were found to be true; and that the Committee had gone through the Bill, and directed him to report the same to the House, without any Amendment." Upon reading the Petition of the Magistrates and Town Council of Cupar, in the County of Fife, under their Common Seal; taking notice of the last-mentioned Bill, and praying their Lordships "to pass the same, and in particular to enact that no heavier Dues shall be exacted from Unfreemen than Freemen of the Burgh of Dundee:"
Upon reading the Petition of The Guildry Incorporation of the Royal Burgh of Cupar, in the County of Fife, under their Common Seal; taking notice of the lastmentioned Bill, and praying their Lordships "to pass the same into a Law, and in particular to enact that the same Rates shall be exacted from all those frequenting the Harbour:"
Upon reading the Petition of The Lord Provost, Dean of Guild and Magistrates of the City of St. Andrews, whose Names are thereunto subscribed; taking notice of the last-mentioned Bill, and praying their Lordships "to pass the same:"
Upon reading the Petition of the Inhabitants of the Town and Neighbourhood of Otley, in the West Riding of Yorkshire, whose Names are thereunto subscribed; praying, "That their Lordships will abolish the exclusive Privileges of The East India Company upon the Expiration of the present Charter; and that His Majesty's Subjects may have full Permission to settle, trade and hold Lands, in India, and all the other British Possessions East of the Cape of Good Hope:"
Upon reading the Petition of the Woollen Cloth Manufacturers, Traders and others in the Town and Vicinity of Stroud, in the County of Gloucester, whose Names are thereunto subscribed; praying their Lordships "to reject all Proposals that may be made for continuing any Restrictions on the natural and Constitutional Rights of their Fellow Subjects to trade with all Countries in Amity with the British Crown, and to reside in the Colonies and Dependencies of the British Empire:"
And also, Upon reading the Petition of the Persons whose Names are thereunto subscribed, being the Minister and Members of the Congregations of Protestant Dissenters of the Independent Denomination at Bawtry, Yorkshire, and Ranskill, Nottinghamshire; severally praying their Lordships "to take the Subject of Slavery into their serious Consideration at the earliest possible Period, with a view to the immediate and total Extinction of it in all Parts of His Majesty's Dominions, and to the Introduction of a much-injured Race to the Enjoyment of Constitutional Freedom:"
Upon reading the Petition of the Persons whose Names are thereunto subscribed, being the Minister and Members of the Congregation of Protestant Dissenters of the Independent Denomination at Providence Chapel, Stainland, in the Parish of Halifax, Yorkshire; praying their Lordships, "That there may be a speedy Extinction of the iniquitous and shameful System of Slavery in every Part of His Majesty's Dominions, and an immediate and honorable Introduction of a long and deeply injured Race to Happiness and Freedom:"
Upon reading the Petition of the Inhabitants of the Parish of the Holy Trinity, Goodramgate, in the City of York, whose Names are thereunto subscribed; taking notice of a Bill depending in this House, intituled, "An Act to make Provision for the lighting and watching of Parishes in England and Wales;" and praying, "That their Lordships will be pleased to pass the same into a Law:"
Upon reading the Petition of the Justices of Peace and Commissioners of Supply of the County of Berwick, whose Names are thereunto subscribed; praying their Lordships not to encrease the Duty on British Spirits without a proportionate Encrease of Duty on Colonial Spirits:"
Upon reading the Petition of the Freeholders, Commissioners of Supply, Justices of the Peace and Landholders of the County of Dumfries, whose Names are thereunto subscribed; praying, "That their Lordships will be pleased, either to reject the proposed additional Duty on British Spirits, or to sanction the Imposition of such an additional Duty on Rum as may ensure to the Agricultural Classes the Protection which in this respect they at present enjoy:"
Upon reading the Petition of the Freeholders, Commissioners of Supply, Justices of the Peace and Landholders of the County of Dumfries, whose Names are thereunto subscribed; praying their Lordships "to assimilate the Inventory Duty in Scotland to the Tax on Personal Estates in England, by repealing those Enactments which require in Scotland a minute and offensive Inventory and Specification of Personal Estates, and impose a Tax on that Inventory, and by substituting in its Stead a Duty similar in its Operation to that on Personal Estates in England:"
Upon reading the Petition of the Magistrates of the King's County, whose Names are thereunto subscribed; praying their Lordships, "That the Bill now introduced into Parliament, to amend the existing Constabulary Laws, may be rejected, as tending not to improve but to injure the Discipline and consequent Efficiency of the Police Establishment in Ireland:"
With a Bill, intituled, "An Act to authorize the issuing of Exchequer Bills for the Payment of the Proprietors of Four Pounds per Centum Annuities in England and Ireland who have signified their Dissent under an Act passed in the present Session for transferring such Annuities into Three Pounds Ten Shillings per Centum Annuities;" to which they desire the Concurrence of this House. To return the Bill, intituled, "An Act to enable the Trustees under the Marriage Settlement of Bouchier Marshall Clerk, deceased, and Elizabeth his Wife, also deceased, to effect a Sale of the Advowson of the Church of Bow otherwise Nymet Tracey, in the County of Devon;" and to acquaint this House, That they have agreed to the same, without any Amendment. To return the Bill, intituled, "An Act for enabling The Bishop of London to grant Building Leases of certain Estates belonging to the said See;" and to acquaint this House, That they have agreed to the same, without any Amendment. To return the Bill, intituled, "An Act for vesting the legal Estate in certain Estates late of Ann Budgen, formerly vested in Elizabeth Pedder deceased in Mortgage, in Edward Rawlings, the present Mortgagee and Trustee of the Equity of Redemption thereof;" and to acquaint this House, That they have agreed to the same, without any Amendment. Hodie 3a vice lecta est Billa, intituled, "An Act for vesting Estates of which Gifford Warriner Esquire, a Lunatic, is Tenant in Tail, in Trustees, for Sale, and also for effecting a Partition of certain Parts thereof, and for granting Leases." Hodie 3a vice lecta est Billa, intituled, "An Act for empowering George William Duke of Argyll and his Trustee to borrow a Sum of Money, and to make it a Charge on the Estate of Argyll, upon certain Conditions." Hodie 3a vice lecta est Billa, intituled, "An Act for vesting Part of the Estates devised by and settled to the Uses of the Wills of James Gordon Esquire, and of his Son James Gordon Esquire, both deceased, situate in the Counties of Hertford and Somerset, and in the Island of Antigua, in the West Indies, in Trustees, to be sold, and for laying out the Monies thence arising in the Purchase of other Estates; and for other Purposes." Hodie 3a vice lecta est Billa, intituled, "An Act for the Improvement and Preservation of the River Wear, and Port and Haven of Sunder and, in the County Palatine of Durham." "The Question was put, "Whether this Bill shall pass?" Hodie 3a vice lecta est Billa, intituled, "An Act for inclosing Lands in the Parish of Little Addington, in the County of Northampton." Hodie 3a vice lecta est Billa, intituled, "An Act to improve the Road through the Town of Bromley, in the County of Kent." Hodie 3a vice lecta est Billa, intituled, "An Act for improving the Drainage of the Lands lying in the North Level, Part of the Great Level of the Fens called Bedford Level, and in Great Portsand, in the Manor of Crowland, and for providing a Navigation between Clow's Cross and the Nene Outfall Cut." Hodie 3a vice lecta est Billa, intituled, "An Act for maintaining and repairing the Road leading from the City of Glasgow, through Cowcaddens, to the North End of the Bridge over that Part of the River Kelvin called the Milnford of Garscube, and for making, repairing and maintaining the Road leading from Blackquarry Toll Bar, by Possil, to the Bridge across the River Allander at Langbank, in the Counties of Lanark and Stirling." Upon reading the Petition of Richard Blakemore of the Leys, in the County of Hereford, Esquire; taking notice of a Bill depending in this House, intituled, "An Act for empowering The Marquis of Bute to make and maintain a Ship Canal, commencing near the Mouth of the River Taff, in the County of Glamorgan, and terminating near the Town of Cardiff, with other Works to communicate therewith;" and praying, "That their Lordships will be pleased not to pass the same into a Law as it at present stands; and that the Petitioner may be heard by himself, his Counsel, Agents and Witnesses, against such Parts of the Preamble of the said Bill, and the Clauses thereof, as he may be advised will aggrieve and injure him:"
Ordered, That John Hunt and William Taylor do attend this House forthwith, in order to their being examined as Witnesses upon the Second Reading of the Bill, intituled, "An Act to prevent Bribery and Corruption in the Election of Burgesses to serve in Parliament for the Borough of East Retford." Ordered, That George Thornton do attend this House forthwith, in order to his being examined as a Witness upon the Second Reading of the last-mentioned Bill; and do bring with him all Letters and Copies of Letters, Memoranda, Accounts, Bills, Receipts, Books, Papers and Writings whatsoever in his Custody, Possession or Power, relating to or in any wise concerning the Election of any Burgess or Burgesses to serve in Parliament for the said Borough, or any Payment or Payments, or any Application or Promise or Offer for Payment, made by or to him the said George Thornton, or any other Person or Persons whomsoever, to or by any Burgess or Burgesses of the said Borough, or any other Person or Persons, before, during, after or in consequence of any such Election. Ordered, That Mary Dawber otherwise Mary Traunter, John Jackson, George Bailey and Philip Mills do attend this House forthwith, in order to their being examined as Witnesses upon the Second Reading of the last-mentioned Bill; and do bring with them all Letters and Copies of Letters, Memoranda, Accounts, Books, Papers and Writings whatsoever in their Custody, Possession or Power, relating to or in any wise concerning any Provisions, Liquors or other Refreshments furnished to any Freemen or Burgesses of the said Borough, or any other Person or Persons whomsoever, before, during, or after the last Election of Burgesses to serve in Parliament for the said Borough, or the Receipt or Payment of any Sum or Sums of Money on account of such Provisions, Liquors and Refreshments. 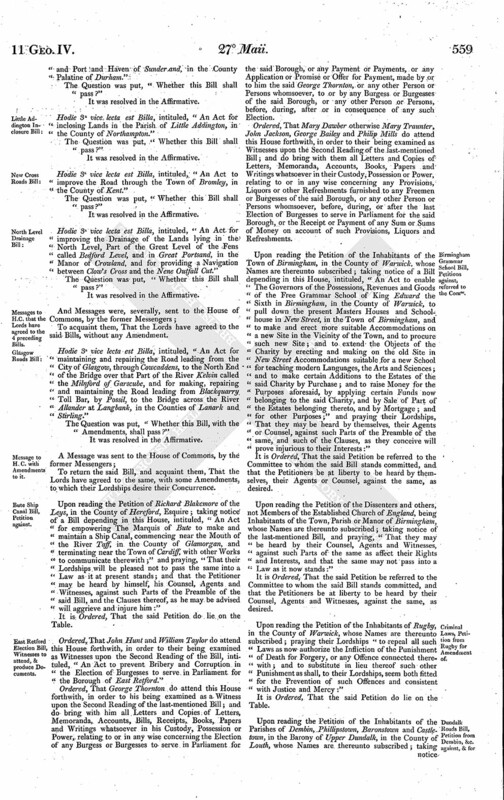 Upon reading the Petition of the Inhabitants of the Town of Birmingham, in the County of Warwick, whose Names are thereunto subscribed; taking notice of a Bill depending in this House, intituled, "An Act to enable The Governors of the Possessions, Revenues and Goods of the Free Grammar School of King Edward the Sixth in Birmingham, in the County of Warwick, to pull down the present Masters Houses and Schoolhouse in New Street, in the Town of Birmingham, and to make and erect more suitable Accommodations on a new Site in the Vicinity of the Town, and to procure such new Site; and to extend the Objects of the Charity by erecting and making on the old Site in New Street Accommodations suitable for a new School for teaching modern Languages, the Arts and Sciences; and to make certain Additions to the Estates of the said Charity by Purchase; and to raise Money for the Purposes aforesaid, by applying certain Funds now belonging to the said Charity, and by Sale of Part of the Estates belonging thereto, and by Mortgage; and for other Purposes;" and praying their Lordships, That they may be heard by themselves, their Agents or Counsel, against such Parts of the Preamble of the same, and such of the Clauses, as they conceive will prove injurious to their Interests:"
It is Ordered, That the said Petition be referred to the Committee to whom the said Bill stands committed, and that the Petitioners be at liberty to be heard by themselves, their Agents or Counsel, against the same, as desired. 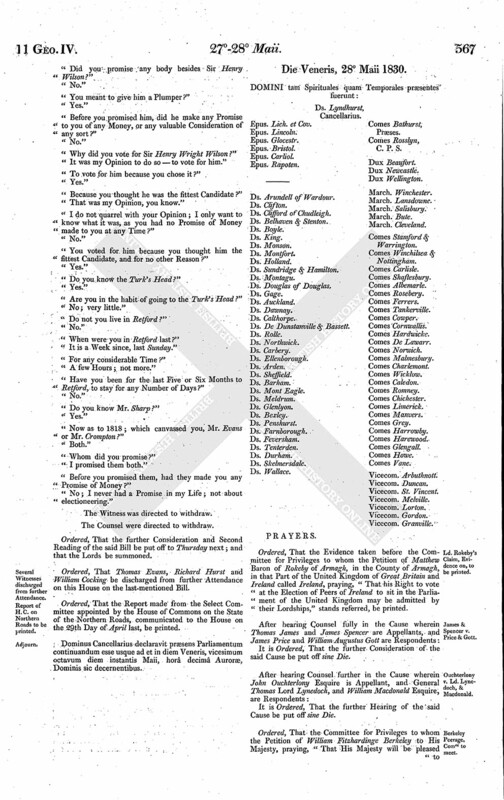 Upon reading the Petition of the Dissenters and others, not Members of the Established Church of England, being Inhabitants of the Town, Parish or Manor of Birmingham, whose Names are thereunto subscribed; taking notice of the last-mentioned Bill, and praying, "That they may be heard by their Counsel, Agents and Witnesses, against such Parts of the same as affect their Rights and Interests, and that the same may not pass into a Law as it now stands:"
It is Ordered, That the said Petition be referred to the Committee to whom the said Bill stands committed, and that the Petitioners be at liberty to be heard by their Counsel, Agents and Witnesses, against the same, as desired. 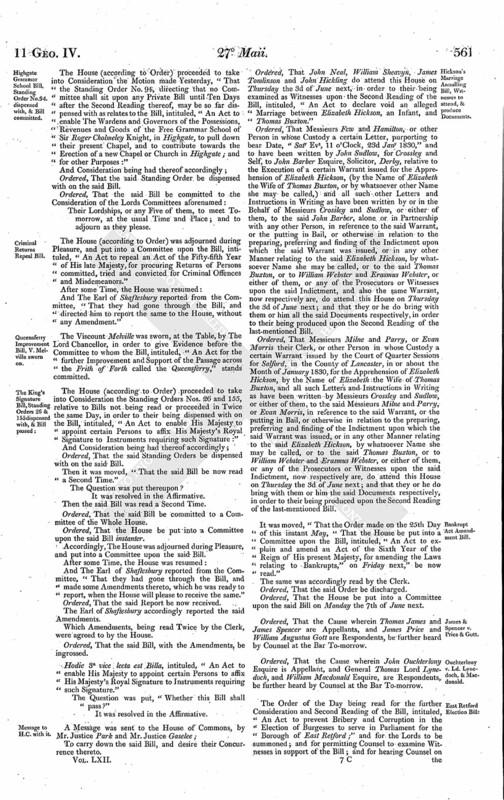 Upon reading the Petition of the Inhabitants of Rugby, in the County of Warwick, whose Names are thereunto subscribed; praying their Lordships "to repeal all such Laws as now authorize the Infliction of the Punishment of Death for Forgery, or any Offence connected therewith; and to substitute in lieu thereof such other Punishment as shall, to their Lordships, seem both fitted for the Prevention of such Offences and consistent with Justice and Mercy:"
Upon reading the Petition of the Inhabitants of the Parishes of Dembin, Phillipstown, Baronstown and Castletown, in the Barony of Upper Dundalk, in the County of Louth, whose Names are thereunto subscribed; taking notice of a Bill, intituled, "An Act for repairing and maintaining the Roads from the Town of Dundalk, in the County of Louth, to the Towns of Castle Blaney and Carrickmacross, in the County of Monaghan;" and praying their Lordships "to reject the same, and that the System of the Grand Jury Laws for Ireland may be altered, amended and re-modelled:"
Hodie 2a vice lecta est Billa, intituled, "An Act for rebuilding the Bridges over the River Spey and Findhorn, for making Accesses thereto, and for making and maintaining certain new Roads, in the County of Elgin." Hodie 2a vice lecta est Billa, intituled, "An Act for better supplying the Inhabitants of the Borough of Macclesfield, in the County of Chester, with Water, and to establish the Rates payable for the same." Hodie 2a vice lecta est Billa, intituled, "An Act to amend Two Acts of His late Majesty, for paving, cleansing, lighting and watching the Town of Dovor, and for removing and preventing Nuisances and Annoyances therein." Hodie 2a vice lecta est Billa, intituled, "An Act to amend an Act of His late Majesty, for inclosing Lands in the Manor of Meltham, in the Parish of Almondbury, in the West Riding of the County of York." Their Lordships, or any Five of them, to meet on Thursday next, at the usual Time and Place; and to adjourn as they please. Ordered, That the Petition of Timothy Dyson of Meltham Mills, in Meltham, in the Parish of Almondbury, in the West Riding of the County of York, One of the Lords of the Manor of Meltham aforesaid; taking notice of the last-mentioned Bill, and praying their Lordships, "That the same may not pass into a Law as it now stands, but that he may be heard by himself, his Counsel or Agents, and Witnesses, against such Parts of the said Bill as may affect him," presented to the House this Day, be referred to the Committee to whom the said Bill stands committed, and that the Petitioner be at liberty to be heard by himself, his Counsel or Agents, and Witnesses, against the same, as desired; and that Counsel be heard for the Bill, at the same Time, if they think fit. Ordered, That all the Lords who have been or shall be present this Session, and are not named of the Committee to whom the said Bill stands committed, be added thereto. Ordered, That Joseph Taylor do attend this House on Thursday next, at One o'Clock, to be sworn, in order to his being examined as a Witness before the Committee to whom the last-mentioned Bill stands committed; and that he do bring with him the Book and Books produced before Michael Stocks Esquire, and signed by him, on the 10th Day of July 1828, relating to the Meltham Inclosure, or to the Execution of the Act of the 57th Year of His late Majesty, for inclosing Lands in the Manor of Meltham, in the Parish of Almondbury, in the West Riding of the County of York; and all Accounts, Receipts, Vouchers and other Papers then produced before the said Michael Stocks Esquire; and also all Books of Proceedings of the Commissioners in the Execution of the said Act; also the Book and Books in which the Entries of Claims under the said Act have been made; and also every Book, Paper or other Document wherein or whereon or whereby any Allotment or Allotments of the said Lands have been set out to any Person or Persons, and any other Authority by which any such Allotments have been delivered or are now held; and all other Books, Papers, Claims, Maps, Plans and Writings whatsoever relating to the Execution of the said Act, or to the said Inclosure, in their respective Custody or Power, in order to their being produced before the said Committee. The House (according to Order) proceeded to take into Consideration the Motion made Yesterday, "That the Standing Order No. 94, directing that no Committee shall sit upon any Private Bill until Ten Days after the Second Reading thereof, may be so far dispensed with as relates to the Bill, intituled, "An Act to enable The Wardens and Governors of the Possessions, Revenues and Goods of the Free Grammar School of Sir Roger Cholmeley Knight, in Highgate, to pull down their present Chapel, and to contribute towards the Erection of a new Chapel or Church in Highgate; and for other Purposes:"
The House (according to Order) was adjourned during Pleasure, and put into a Committee upon the Bill, intituled, "An Act to repeal an Act of the Fifty-fifth Year of His late Majesty, for procuring Returns of Persons committed, tried and convicted for Criminal Offences and Misdemeanors." The Viscount Melville was sworn, at the Table, by The Lord Chancellor, in order to give Evidence before the Committee to whom the Bill, intituled, "An Act for the further Improvement and Support of the Passage across the Frith of Forth called the Queensferry," stands committed. The House (according to Order) proceeded to take into Consideration the Standing Orders Nos. 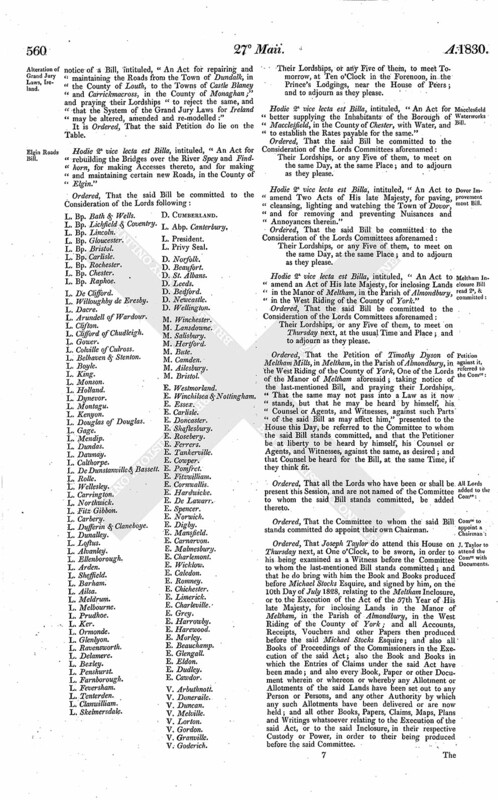 26 and 155, relative to Bills not being read or proceeded in Twice the same Day, in order to their being dispensed with on the Bill, intituled, "An Act to enable His Majesty to appoint certain Persons to affix His Majesty's Royal Signature to Instruments requiring such Signature:"
Ordered, That the said Standing Orders be dispensed with on the said Bill. Then it was moved, "That the said Bill be now read a Second Time." Ordered, That the House be put into a Committee upon the said Bill instanter. Accordingly, The House was adjourned during Pleasure, and put into a Committee upon the said Bill. And The Earl of Shaftesbury reported from the Committee, "That they had gone through the Bill, and made some Amendments thereto, which he was ready to report, when the House will please to receive the same." Ordered, That the said Report be now received. The Earl of Shaftesbury accordingly reported the said Amendments. Hodie 3a vice lecta est Billa, intituled, "An Act to enable His Majesty to appoint certain Persons to affix His Majesty's Royal Signature to Instruments requiring such Signature." Ordered, That John Neal, William Sheavyn, James Tomlinson and John Hickling do attend this House on Thursday the 3d of June next, in order to their being examined as Witnesses upon the Second Reading of the Bill, intituled, "An Act to declare void an alleged Marriage between Elizabeth Hickson, an Infant, and Thomas Buxton." Ordered, That Messieurs Few and Hamilton, or other Person in whose Custody a certain Letter, purporting to bear Date, "Saty Evg, 11 o'Clock, 23d Jany 1830," and to have been written by John Sudlow, for Crossley and Self, to John Barber Esquire, Solicitor, Derby, relative to the Execution of a certain Warrant issued for the Apprehension of Elizabeth Hickson, (by the Name of Elizabeth the Wife of Thomas Buxton, or by whatsoever other Name she may be called,) and all such other Letters and Instructions in Writing as have been written by or in the Behalf of Messieurs Crossley and Sudlow, or either of them, to the said John Barber, alone or in Partnership with any other Person, in reference to the said Warrant, or the putting in Bail, or otherwise in relation to the preparing, preferring and finding of the Indictment upon which the said Warrant was issued, or in any other Manner relating to the said Elizabeth Hickson, by whatsoever Name she may be called, or to the said Thomas Buxton, or to William Webster and Erasmus Webster, or either of them, or any of the Prosecutors or Witnesses upon the said Indictment, and also the same Warrant, now respectively are, do attend this House on Thursday the 3d of June next; and that they or he do bring with them or him all the said Documents respectively, in order to their being produced upon the Second Reading of the last-mentioned Bill. Ordered, That Messieurs Milne and Parry, or Evan Morris their Clerk, or other Person in whose Custody a certain Warrant issued by the Court of Quarter Sessions for Salford, in the County of Lancaster, in or about the Month of January 1830, for the Apprehension of Elizabeth Hickson, by the Name of Elizabeth the Wife of Thomas Buxton, and all such Letters and Instructions in Writing as have been written by Messieurs Crossley and Sudlow, or either of them, to the said Messieurs Milne and Parry, or Evan Morris, in reference to the said Warrant, or the putting in Bail, or otherwise in relation to the preparing, preferring and finding of the Indictment upon which the said Warrant was issued, or in any other Manner relating to the said Elizabeth Hickson, by whatsoever Name she may be called, or to the said Thomas Buxton, or to William Webster and Erasmus Webster, or either of them, or any of the Prosecutors or Witnesses upon the said Indictment, now respectively are, do attend this House on Thursday the 3d of June next; and that they or he do bring with them or him the said Documents respectively, in order to their being produced upon the Second Reading of the last-mentioned Bill. 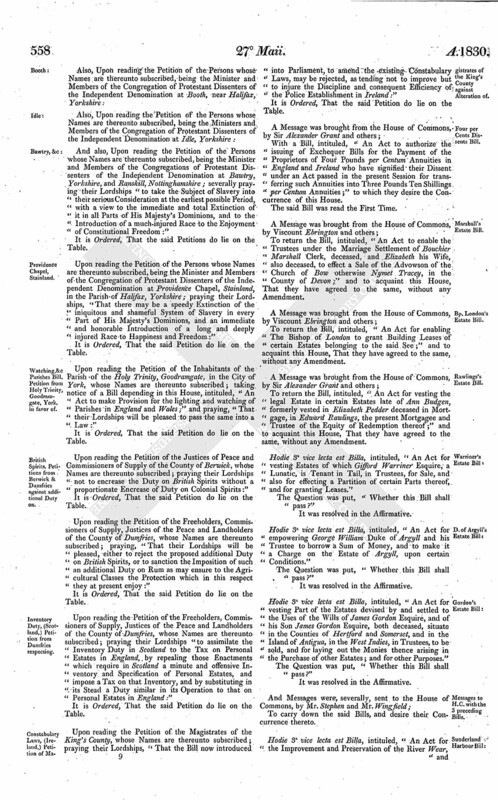 It was moved, "That the Order made on the 25th Day of this instant May, "That the House be put into a Committee upon the Bill, intituled, "An Act to explain and amend an Act of the Sixth Year of the Reign of His present Majesty, for amending the Laws relating to Bankrupts," on Friday next," be now read." Ordered, That the House be put into a Committee upon the said Bill on Monday the 7th of June next. Ordered, That the Cause wherein Thomas James and James Spencer are Appellants, and James Price and William Augustus Gott are Respondents, be further heard by Counsel at the Bar To-morrow. Ordered, That the Cause wherein John Ouchterlony Esquire is Appellant, and General Thomas Lord Lynedoch, and William Macdonald Esquire, are Respondents, be further heard by Counsel at the Bar To-morrow. The Order of the Day being read for the further Consideration and Second Reading of the Bill, intituled, "An Act to prevent Bribery and Corruption in the Election of Burgesses to serve in Parliament for the Borough of East Retford;" and for the Lords to be summoned; and for permitting Counsel to examine Witnesses in support of the Bill; and for hearing Counsel on the Petition of the Burgesses of the Borough of East Retford, in the County of Nottingham, whose Names are thereunto subscribed, praying their Lordships, "That the said Bill may not pass into a Law;"
(Mr. Law.) "Is your Name Thomas Evans?" "Are you a Burgess of East Retford?" "When were you admitted; in what Year?" "Well, I cannot speak to that; about Five-and-twenty Years back." "Do you recollect the Election of Mr. Marsh and Mr. Osbaldeston?" "Did you promise either of those Gentlemen your Vote?" "Do you know the Angel Inn in Retford?" 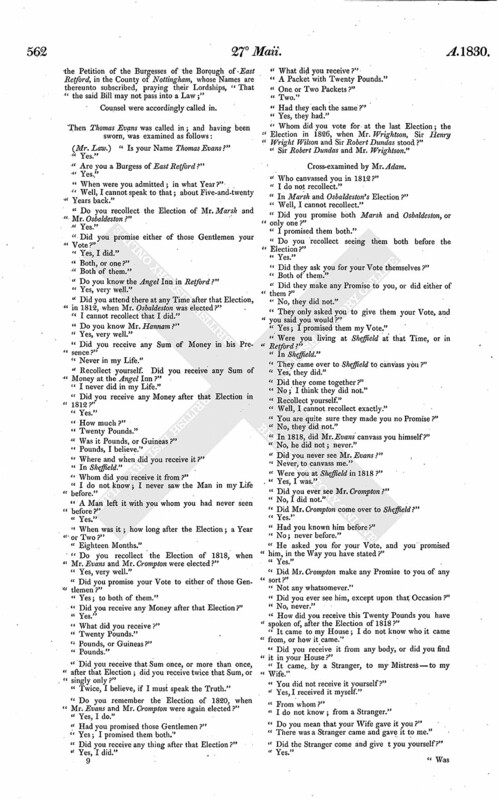 "Did you attend there at any Time after that Election, in 1812, when Mr. Osbaldeston was elected?" "I cannot recollect that I did." "Do you know Mr. Hannam?" "Did you receive any Sum of Money in his Presence?" "Recollect yourself. Did you receive any Sum of Money at the Angel Inn?" "I never did in my Life." "Did you receive any Money after that Election in 1812?" "Was it Pounds, or Guineas?" "Where and when did you receive it?" "Whom did you receive it from?" "I do not know; I never saw the Man in my Life before." "A Man left it with you whom you had never seen before?" "When was it; how long after the Election; a Year or Two?" "Do you recollect the Election of 1818, when Mr. Evans and Mr. Crompton were elected?" "Did you promise your Vote to either of those Gentlemen?" "Yes; to both of them." "Did you receive any Money after that Election?" "Did you receive that Sum once, or more than once, after that Election; did you receive twice that Sum, or singly only?" "Twice, I believe, if I must speak the Truth." "Do you remember the Election of 1820, when Mr. Evans and Mr. Crompton were again elected?" "Had you promised those Gentlemen?" "Yes; I promised them both." "Did you receive any thing after that Election?" "A Packet with Twenty Pounds." "Had they each the same?" "Whom did you vote for at the last Election; the Election in 1826, when Mr. Wrightson, Sir Henry Wright Wilson and Sir Robert Dundas stood?" Sir Robert Dundas and Mr. Wrightson"
"Who canvassed you in 1812?" "In Marsh and Osbaldeston's Election?" "Did you promise both Marsh and Osbaldeston, or only one?" "Do you recollect seeing them both before the Election?" "Did they ask you for your Vote themselves?" "Did they make any Promise to you, or did either of them?" "They only asked you to give them your Vote, and you said you would?" "Yes; I promised them my Vote." "Were you living at Sheffield at that Time, or in Retford?" "They came over to Sheffield to canvass you?" "No; I think they did not." "Well, I cannot recollect exactly." "You are quite sure they made you no Promise?" "In 1818, did Mr. Evans canvass you himself?" "No, he did not; never." "Did you never see Mr. Evans?" "Were you at Sheffield in 1818?" "Did you ever see Mr. Crompton?" "Did Mr. Crompton come over to Sheffield?" "Had you known him before?" "He asked you for your Vote, and you promised him, in the Why you have stated?" "Did Mr. Crompton make any Promise to you of any sort?" "Did you ever see him, except upon that Occasion?" "How did you receive this Twenty Pounds you have spoken of, after the Election of 1818?" "It came to my House; I do not know who it came from, or how it came." "Did you receive it from any body, or did you find it in your House?" "It came, by a Stranger, to my Mistress -to my Wife." "You did not receive it yourself?" "Yes, I received it myself." "I do not know; from a Stranger." "Do you mean that your Wife gave it you?" "There was a Stranger came and gave it to me." "Did the Stranger come and give t you yourself?" "Was it a Packet, or what?" "Did you receive more Packets than One?" "Yes; I received more Packets than One." "On that Occasion after 1818?" 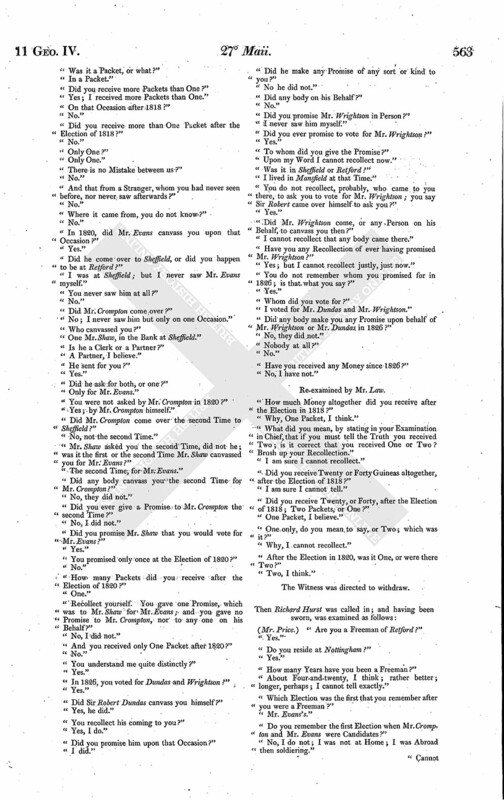 "Did you receive more than One Packet after the Election of 1818?" "There is no Mistake between us?" "And that from a Stranger, whom you had never seen before, nor never saw afterwards?" "Where it came from, you do not know?" "In 1820, did Mr. Evans canvass you upon that Occasion?" "Did he come over to Sheffield, or did you happen to be at Retford?" "I was at Sheffield; but I never saw Mr. Evans myself." "You never saw him at all?" "Did Mr. Crompton come over?" "No; I never saw him but only on one Occasion." "One Mr. Shaw, in the Bank at Sheffield." "Is he a Clerk or a Partner?" "Did he ask for both, or one?" "You were not asked by Mr. Crompton in 1820?" "Yes; by Mr. Crompton himself." "Did Mr. Crompton come over the second Time to Sheffield?" "No, not the second Time." "Mr. Shaw asked you the second Time, did not he; was it the first or the second Time Mr. Shaw canvassed you for Mr. Evans?" "The second Time, for Mr. Evans." "Did any body canvass you the second Time for Mr. Crompton?" "Did you ever give a Promise to Mr. Crompton the second Time?" "Did you promise Mr. Shaw that you would vote for Mr. Evans?" "You promised only once at the Election of 1820?" "How many Packets did you receive after the Election of 1820?" "Recollect yourself. You gave one Promise, which was to Mr. Shaw for Mr. Evans; and you gave no Promise to Mr. Crompton, nor to any one on his Behalf?" "And you received only One Packet after 1820?" "You understand me quite distinctly?" "In 1826, you voted for Dundas and Wrightson?" "Did Sir Robert Dundas canvass you himself?" "You recollect his coming to you?" "Did you promise him upon the Occasion?" "Did he make any Promise of any sort or kind to you?" "Did any body on his Behalf?" "Did you promise Mr. Wrightson in Person?" "I never saw him myself." "Did you ever promise to vote for Mr. Wrightson?" "To whom did you give the Promise?" "Upon my Word I cannot recollect now." "Was it in Sheffield or Retford?" "I lived in Mansfield at that Time." "You do not recollect, probably, who came to you there, to ask you to vote for Mr. Wrightson; you say Sir Robert came over himself to ask you?" "Did Mr. Wrightson come, or any Person on his Behalf, to canvass you then?" "I cannot recollect that any body came there." "Have you any Recollection of ever having promised Mr. Wrightson?" "Yes; but I cannot recollect justly, just now." "You do not remember whom you promised for in 1826; is that what you say?" "Whom did you vote for?" "I voted for Mr. Dundas and Mr. Wrightson." "Did any body make you any Promise upon behalf of Mr. Wrightson or Mr. Dundas in 1826?" "Have you received any Money since 1826?" "How much Money altogether did you receive after the Election in 1818?" "Why, One Packet, I think." "What did you mean, by stating in your Examination in Chief, that if you must tell the Truth you received Two; is it correct that you received One or Two? Brush up your Recollection." "I am sure I cannot recollect." "Did you receive Twenty or Forty Guineas altogether, after the Election of 1818?" "I am sure I cannot tell." "Did you receive Twenty, or Forty, after the Election of 1818; Two Packets, or One?" "One only, do you mean to say, or Two; which was it?" "After the Election in 1820, was it One, or were there Two?" (Mr. Price.) "Are you a Freeman of Retford?" "Do you reside at Nottingham?" "How many Years have you been a Freeman?" "About Four-and-twenty, I think; rather better; longer, perhaps; I cannot tell exactly." "Which Election was the first that you remember after you were a Freeman?" "Do you remember the first Election when Mr. Crompton and Mr. Evans were Candidates?" "No, I do not; I was not at Home; I was Abroad then soldiering." "Cannot you tell about what Time you were made a Freeman?" "I cannot tell exactly, I am sure." "It was about Four-and-twenty Years ago, you think?" 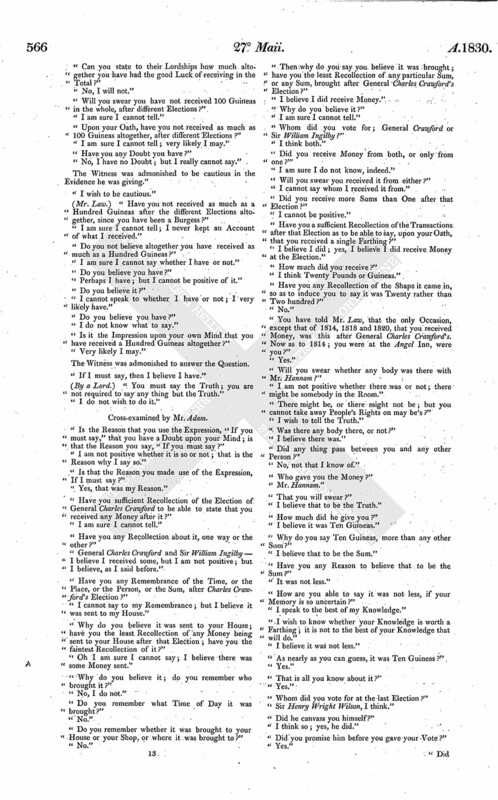 "Do you recollect the Election of Mr. Osbaldeston and Mr. Marsh?" "Were you a Freeman at that Time?" "I was a Freeman at that Time." "Did you promise your Vote to those Gentlemen?" "To Mr. Osbaldeston, I did." "Not any; not a Farthing of any Description." "Where were you resident at that Time?" "Were you in England at the Time of the last Election of Mr. Evans and Mr. Crompton, in 1818?" "Yes, I believe I was." "Did you promise either of those Gentlemen?" "Was he the only one you promised?" "He was the only one I promised." "After that Election, did you receive any Money?" "Not a Farthing of any one." "Did you receive any Packet?" "No, I received no Packet." "Did any other Person receive any Packet for you?" "I have understood my Wife received One." "Did your Wife ever deliver the Packet to you?" "Did she deliver any Money to you after that Election?" The Counsel and Witness were directed to withdraw. The Counsel and Witness were again called in. (Mr. Price.) 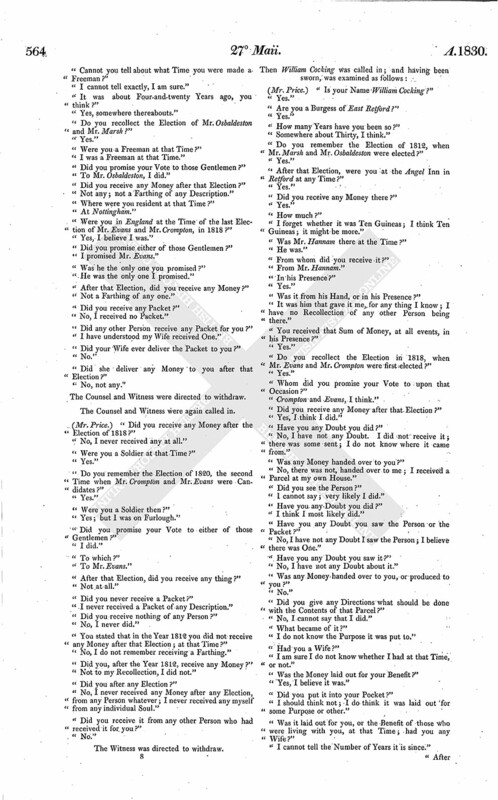 "Did you receive any Money after the Election of 1818?" "No, I never received any at all." "Were you a Soldier at that Time?" "Do you remember the Election of 1820, the second Time when Mr. Crompton and Mr. Evans were Candidates?" "Were you a Soldier then?" "Yes; but I was on Furlough." "After that Election, did you receive any thing?" "Did you never receive a Packet?" "I never received a Packet of any Description." "Did you receive nothing of any Person?" "You stated that in the Year 1812 you did not receive any Money after that Election; at that Time?" "No, I do not remember receiving a Farthing." "Did you, after the Year 1812, receive any Money?" "Not to my Recollection, I did not." "Did you after any Election?" "No, I never received any Money after any Election, from any Person whatever; I never received any myself from any individual Soul." "Did you receive it from any other Person who had received it for you?" (Mr. Price.) "Is your Name William Cocking?" "Somewhere about Thirty, I think." "Do you remember the Election of 1812, when Mr. Marsh and Mr. Osbaldeston were elected?" "After that Election, were you at the Angel Inn in Retford at any Time?" "Did you receive any Money there?" "I forget whether it was Ten Guineas; I think Ten Guineas; it might be more." "Was Mr. Hannam there at the Time?" "From whom did you receive it?" "Was it from his Hand, or in his Presence?" "It was him that gave it me, for any thing I know; I have no Recollection of any other Person being there." "You received that Sum of Money, at all events, in his Presence?" "Do you recollect the Election in 1818, when Mr. Evans and Mr. Crompton were first elected?" "Whom did you promise your Vote to upon that Occasion?" "Crompton and Evans, I think." "Have you any Doubt you did?" "No, I have not any Doubt. I did not receive it; there was some sent; I do not know where it came from." "Was any Money handed over to you?" "No, there was not, handed over to me; I received a Parcel at my own House." "Did you see the Person?" "I cannot say; very likely I did." "I think I most likely did." "Have you any Doubt you saw the Person or the Packet?" "No, I have not any Doubt I saw the Person; I believe there was One." "Have you any Doubt you saw it?" "No, I have not any Doubt about it." "Was any Money handed over to you, or produced to you?" "Did you give any Directions what should be done with the Contents of that Parcel?" "No, I cannot say that I did." "I do not know the Purpose it was put to." "I am sure I do not know whether I had at that Time, or not." "Was the Money laid out for your Benefit?" "Did you put it into your Pocket?" "I should think not; I do think it was laid out for some Purpose or other." "Was it laid out for you, or the Benefit of those who were living with you, at that Time; had you any Wife?" "I cannot tell the Number of Years it is since." "After the Election of 1818; Twelve Years ago?" "Yes; I had a Wife at that Time, certainly." "Did your Wife keep your Household and pay your Expences?" "Yes, sometimes; and sometimes I paid them myself; according to Circumstances." "Was this Money laid out in paying your Expences?" "It was laid out for some Purpose, but I cannot tell for what." "Did you take any Steps to advertise, or return it to any body?" "No; I did not know where to return it to." "You took no Step about it?" "What did you believe the Money was sent for; on what Account?" "Well, I am sure I cannot tell on what Account." "Did you know or believe that it had reference to the Election?" "It was very likely so." "Have you any Doubt of it?" "No, I have no Doubt of it." "Do you recollect the Election of 1820?" "I dare say it was the same again." "How much was the same?" "Twenty Pounds or Twenty Guineas, probably; I cannot speak accurately to it." "Was that one the only one?" "Did you receive that Sum singly, or Twice that Sum; did you receive Twenty or Forty Pounds or Guineas?" "If I received Two Parcels, it was very likely Forty." "Did you receive Two Parcels?" "I cannot speak to that confidently." "To the best of your Belief and Recollection, did you?" "Yes, I might, to the best of my Belief." "Did you promise your Vote before the Election of 1820, when Mr. Evans and Mr. Crompton were elected the second Time?" "Have you any Doubt of that?" "Do you recollect the Election of Robert Crawford and John Jeffrey Esquire in 1802?" "Did you vote for either of those Gentlemen?" "Do you recollect the Election of William Petrie Esquire and Sir Wharton Amcotts?" "I recollect it, but I was not a Voter at that Time." 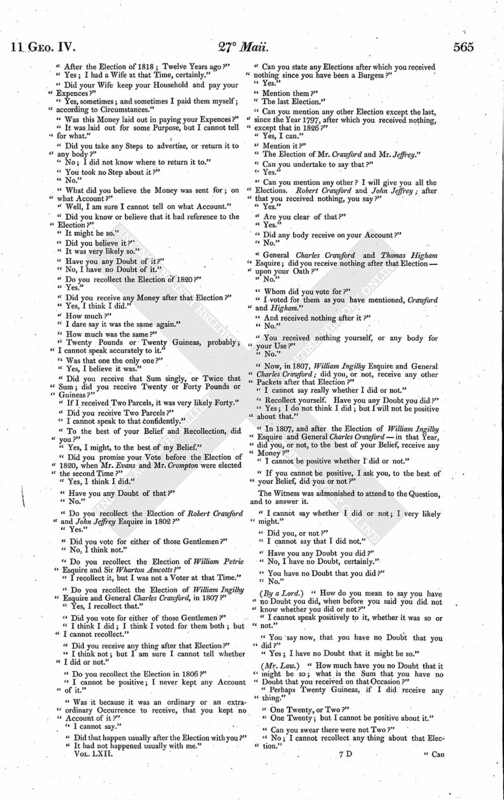 "Do you recollect the Election of William Ingilby Esquire and General Charles Crawford, in 1807?" "I think I did; I think I voted for them both; but I cannot recollect." "I think not; but I am sure I cannot tell whether I did or not." "Do you recollect the Election in 1806?" "I cannot be positive; I never kept any Account of it." "Was it because it was an ordinary or an extraordinary Occurrence to receive, that you kept no Account of it?" "Did that happen usually after the Election with you?" "It had not happened usually with me." "Can you state any Elections after which you received nothing since you have been a Burgess?" "Can you mention any other Election except the last, since the Year 1797, after which you received nothing, except that in 1826?" "The Election of Mr. Crawford and Mr. Jeffrey." "Can you undertake to say that?" "Can you mention any other? I will give you all the Elections. Robert Crawford and John Jeffrey; after that you received nothing, you say?" "Are you clear of that?" "Did any body receive on your Account?" "General Charles Crawford and Thomas Higham Esquire; did you receive nothing after that Election- upon your Oath?" "I voted for them as you have mentioned, Crawford and Higham." "And received nothing after it?" "You received nothing yourself, or any body for your Use?" "Now, in 1807, William Ingilby Esquire and General Charles Crawford; did you, or not, receive any other Packets after that Election?" "I cannot say really whether I did or not." "Recollect yourself. Have you any Doubt you did?" "Yes; I do not think I did; but I will not be positive about that." "In 1807, and after the Election of William Ingilby Esquire and General Charles Crawford-in that Year, did you, or not, to the best of your Belief, receive any Money?" "I cannot be positive whether I did or not." "If you cannot be positive, I ask you, to the best of your Belief, did you or not?" The Witness was admonished to attend to the Question, and to answer it. "I cannot say whether I did or not; I very likely might." "I cannot say that I did not." "No, I have no Doubt, certainly." "You have no Doubt that you did?" (By a Lord.) "How do you mean to say you have no Doubt you did, when before you said you did not know whether you did or not?" "I cannot speak positively to it, whether it was so or not." "You say now, that you have no Doubt that you did?" "Yes; I have no Doubt that it might be so." (Mr. Law.) "How much have you no Doubt that it might be so; what is the Sum that you have no Doubt that you received on that Occasion?" "Perhaps Twenty Guineas, if I did receive any thing." "One Twenty; but I cannot be positive about it." "Can you swear there were not Two?" "No; I cannot recollect any thing about that Election." "Can you state to their Lordships how much altogether you have had the good Luck of receiving in the Total?" "Will you swear you have not received 100 Guineas in the whole, after different Elections?" "Upon your Oath, have you not received as much as 100 Guineas altogether, after different Elections?" "I am sure I cannot tell; very likely I may." "Have you any Doubt you have?" "No, I have no Doubt; but I really cannot say." The Witness was admonished to be cautious in the Evidence he was giving." "I wish to be cautious." (Mr. Law.) "Have you not received as much as a Hundred Guineas after the different Elections altogether, since you have been a Burgess?" "I am sure I cannot tell; I never kept an Account of what I received." "Do you not believe altogether you have received as much as a Hundred Guineas?" "I am sure I cannot say whether I have or not." "Do you believe you have?" "Perhaps I have; but I cannot be positive of it." "I cannot speak to whether I have or not; I very likely have." "Is it the Impression upon your own Mind that you have received a Hundred Guineas altogether?" The Witness was admonished to answer the Question. "If I must say, then I believe I have." (By a Lord.) "You must say the Truth; you are not required to say any thing but the Truth." "I do not wish to do it." "Is the Reason that you use the Expression, "If you must say," that you have a Doubt upon your Mind; is that the Reason you say, "If you must say?" "I am not positive whether it is so or not; that is the Reason why I say so." "Is that the Reason you made use of the Expression, If I must say?" "Yes, that was my Reason." "Have you sufficient Recollection of the Election of General Charles Crawford to be able to state that you received any Money after it?" "Have you any Recollection about it, one way or the other?" "General Charles Crawford and Sir William Ingilby- I believe I received some, but I am not positive; but I believe, as I said before." "Have you any Remembrance of the Time, or the Place, or the Person, or the Sum, after Charles Crawford's Election?" "I cannot say to my Remembrance; but I believe it was sent to my House." "Why do you believe it was sent to your House; have you the least Recollection of any Money being sent to your House after that Election; have you the faintest Recollection of it?" "Oh I am sure I cannot say; I believe there was some Money sent." "Why do you believe it; do you remember who brought it?" "Do you remember what Time of Day it was brought?" "Do you remember whether it was brought to your House or your Shop, or where it was brought to?" "Then why do you say you believe it was brought; have you the least Recollection of any particular Sum, or any Sum, brought after General Charles Crawford's Election?" "I believe I did receive Money." "Whom did you vote for; General Crawford or Sir William Ingilby?" "Did you receive Money from both, or only from one?" "I am sure I do not know, indeed." "Will you swear you received it from either?" "I cannot say whom I received it from." "Did you receive more Sums than One after that Election?" "Have you a sufficient Recollection of the Transactions after that Election as to be able to say, upon your Oath, that you received a single Farthing?" "I believe I did; yes, I believe I did receive Money at the Election." "How much did you receive?" "I think Twenty Pounds or Guineas." "Have you any Recollection of the Shape it came in, so as to induce you to say it was Twenty rather than Two hundred?" "You have told Mr. Law, that the only Occasion, except that of 1814, 1818 and 1820, that you received Money, was this after General Charles Crawford's. Now as to 1814; you were at the Angel Inn, were you?" "Will you swear whether any body was there with Mr. Hannam?" "I am not positive whether there was or not; there might be somebody in the Room." "There might be, or there might not be; but you cannot take away People's Rights on may be's?" "I wish to tell the Truth." "Was there any body there, or not?" "Did any thing pass between you and any other Person?" "I believe that to be the Truth." "How much did he give you?" "I believe it was Ten Guineas." "Why do you say Ten Guineas, more than any other Sum?" "I believe that to be the Sum." "Have you any Reason to believe that to be the Sum?" "How are you able to say it was not less, if your Memory is so uncertain?" "I speak to the best of my Knowledge." "I wish to know whether your Knowledge is worth a Farthing; it is not to the best of your Knowledge that will do." "I believe it was not less." "As nearly as you can guess, it was Ten Guineas?" "That is all you know about it?" "Whom did you vote for at the last Election?" "Sir Henry Wright Wilson, I think." "Did he canvass you himself?" "I think so; yes, he did." "Did you promise him before you gave your Vote?" "Did you promise any body besides Sir Henry Wilson?" "You meant to give him a Plumper?" "Before you promised him, did he make any Promise to you of any Money, or any valuable Consideration of any sort?" "Why did you vote for Sir Henry Wright Wilson?" "It was my Opinion to do so-to vote for him." "To vote for him because you chose it?" "Because you thought he was the fittest Candidate?" "That was my Opinion, you know." "I do not quarrel with your Opinion; I only want to know what it was, as you had no Promise of Money made to you at any Time?" "You voted for him because you thought him the fittest Candidate, and for no other Reason?" "Do you know the Turk's Head?" "Are you in the habit of going to the Turk's Head?" "Do not you live in Retford?" "When were you in Retford last?" "It is a Week since, last Sunday." "A few Hours; not more." "Have you been for the last Five or Six Months to Retford, to stay for any Number of Days?" "Do you know Mr. Sharp?" "Now as to 1818; which canvassed you, Mr. Evans or Mr. Crompton?" "Before you promised them, had they made you any Promise of Money?" "No; I never had a Promise in my Life; not about electioneering." Ordered, That Thomas Evans, Richard Hurst and William Cocking be discharged from further Attendance on this House on the last-mentioned Bill. Ordered, That the Report made from the Select Committee appointed by the House of Commons on the State of the Northern Roads, communicated to the House on the 29th Day of April last, be printed. Dominus Cancellarius declaravit præsens Parliamentum continuandum esse usque ad et in diem Veneris, vicesimum octavum diem instantis Maii, horâ decimâ Auroræ, Dominis sic decernentibus.